As I discussed in the introduction to this series “The Perception Problem,” the human attention span has now been reduced to less than 10 seconds. Therefore brand perception can have a nearly immediate effect on your business. So, let’s first see how your logos, identities and wordmarks can affect brand positioning and perception. Think to yourself about some of the world’s most popular and recognizable brands…UPS, Coca-Cola, Starbucks. What is one of the more distinguishing features of each of these company’s identities? Color. This is a great, short-watch video about the power of color in branding. Not ironically, the University of Oregon (who produced this video) is also highly recognizable in the college world for their colors…green and yellow. 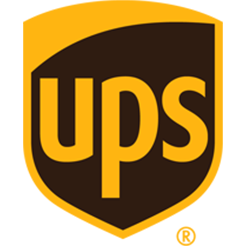 Their brand has such a saturation in the perception of consumers that the color brown is synonymous with UPS to many, even those who do not use UPS often. Starbucks is known for multiple colors. 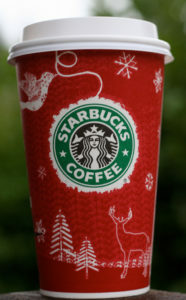 Not only is the green of their logo highly recognizable, but their decade-old Red Cup campaign has become a holiday tradition. Color in brand identity must also be seen as a purveyor of emotion. 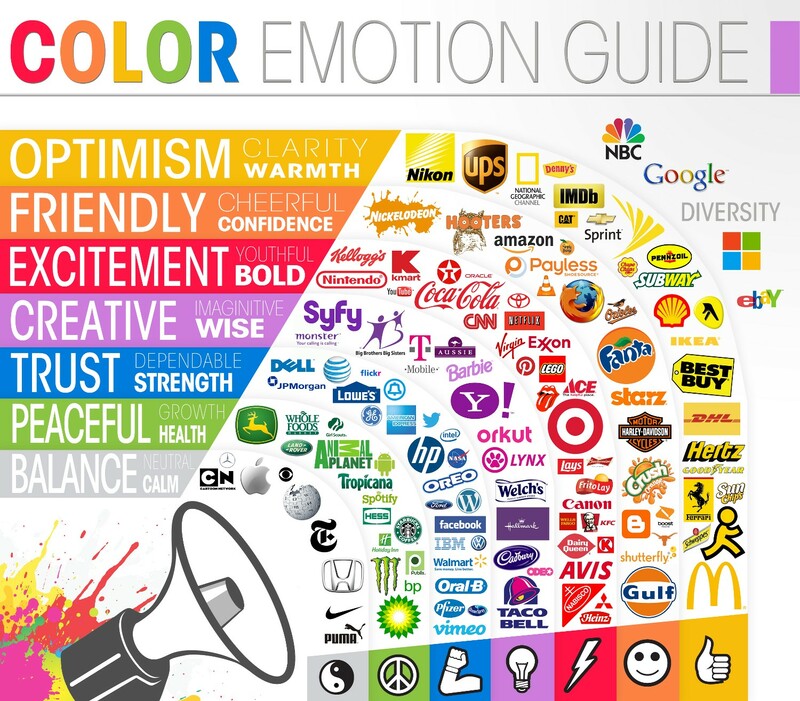 Check out how some of the brands in the chart below are categorized based on the emotion their brand color evokes. So, you see how choice of color can greatly affect the perception of your brand, especially in the short amount of time you have to catch the attention of consumers. Continuing on the theme of short attention spans and brand recognition, let’s talk about shape, sizing and simplicity of your identity. Look back up at the color chart above. Take 2-3 seconds to glance at the image. What brands stick out to you first? My list: Target, McDonalds, Yahoo, BP. Why do these identities stand out more than the others? Simplicity. 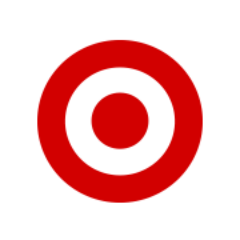 Target is recognizable worldwide, yet its logo may be one of the more simple marks out there. Two circles together to form a target. And, their logo is rarely shown together with their wordmark. Why is this? The target symbol is successful not only in that it is pleasing to the eye, but it is also simple in nature and recognizable at any size and on any medium. The target symbol is just as powerful on a mobile phone, coupon or small flyer as it is on a storefront or billboard. Look back at the chart above and tell me which logos are difficult to read or recognize at small sizes. While I’m not going to go into the negatives of some popular brand logos, you can test for yourself which ones lose some of their effectiveness at smaller sizes. Is your brand identity as effective at smaller sizes? If not, how can you change this? While your brand name is important in perception, so is the treatment of your official wordmark. Different font styles and weights can evoke different perceptions. For example, a heavily serifed wordmark can be perceived as more timely, professional or classy. A script, brush or hand-drawn wordmark can be seen as edgy, youthful, cool or trendy. The branding firm Siegel + Gale did an extensive study on how consumers perceived brands based on their logos/wordmarks. Their study also found that initialed wordmarks (using initials of your company instead of the full name), along with hand-drawn and illustrative wordmarks, are seen as edgy and cool as well. Head on over to Logo Design Love to see more of the full report. This refers to the design of a logo that is perceived as “dirty” or sexual in nature. And, while Im not going to display examples of this, I have included several articles below that describe this concept in greater detail. Your logo and wordmark are only part of your overall brand. However, the effectiveness of your design (color, scalability, shape) can quickly change the perception of consumers. So, don’t take it for granted. Look for part 3 of The Perception Problem soon, where we will cover websites.